Dr. Riley received her bachelor’s degree in Biology at Belhaven College in Jackson, Mississippi. She earned a medical degree from the University of Tennessee College of Medicine and went on to complete an Internal Medicine residency at the University of Tennessee Health Science Center in Memphis, Tennessee, where she was the Chief Medical Resident. While in residency, Dr. Riley worked at St. Jude Children’s Research Hospital where she was a part of the Pediatric Oncology Education Program and assisted the administration of anesthesia to patients undergoing procedures. 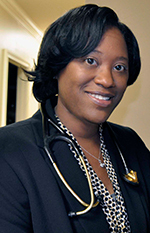 Dr. Riley remained at the University of Tennessee Health Science Center to complete her fellowship in Nephrology.